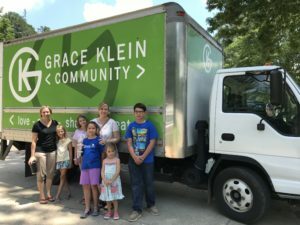 As Grace Klein Community continues to grow, so does our dire need for helping hands around the office. As summer approached, we felt the Lord tell us to simply “ask.” Our theme for June and July is “Summer Serve,” encouraging folks to reach out to serve alongside us with the extra hours they might have to share over the summer. The Lord not only opened the door, he opened the floodgates of folks with hearts willing to give of their all, no matter the task. 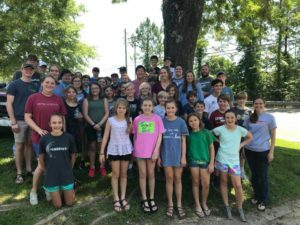 On June 8th, approximately 40 Meadowbrook Baptist VBS rising 6th graders gave their very best to love on Birmingham by serving in various capacities at Grace Klein Community. Some wrote encouraging words/phrases on boxes delivered to food recipients, while others picked peaches from our glorious peach tree on the property. Another crew helped load the trailer with boxes for recycling, while others sorted and categorized non-perishable food items on shelves in preparation for food delivery. 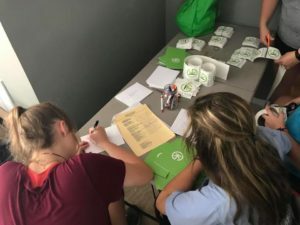 What a blessing to have happy hearts help us write “Thank You” notes to our gracious donors, and see our “Big Green” box truck being cleaned out for the next food rescue run. 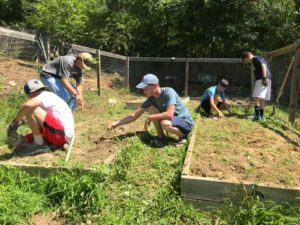 The community garden can often be quite the task, but nothing seemed to get the Meadowbrook Baptist group down. On June 23rd, 11 new friends from Shades Mountain Community Church graciously blessed us with their time! If you notice a special “Thank You” note in your mail, know that a dear heart wrote it as they prayed for you, thanking the Lord for your life. The sweet smiles of these folks are precious! They turn “work” into a privilege! Our Give and Take Room looks amazing after they spent some time organizing donations into appropriate bins, and our Food Delivery shelves are clean and so neatly organized. On June 26th, the sweetest American Heritage Girls came to serve! The heart of American Heritage Girls is “Building women of integrity through service to God, family, community and country.” Let’s just say, their program is working and these girls are living out the mission! Available on Sundays? Can you help host our Sunday Market? Email natalie@gracekleincommunity.com the days/times you as a family, an individual, a church or small group would like to serve. We are so thankful to each and every volunteer who walks through our doors. It literally takes a village for us to accomplish all that needs to take place in a month. Know that your efforts have much impact in Greater Birmingham and around the world.